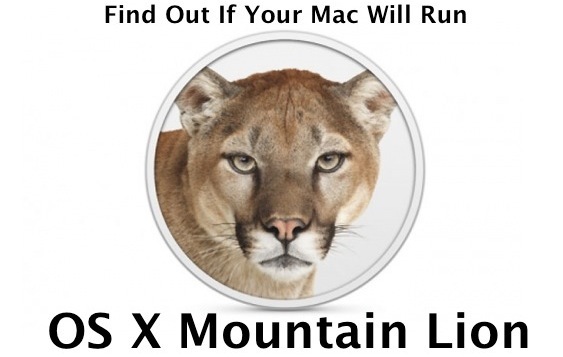 Wondering if your Mac will run OS X Mountain Lion? Most new Macs will, but here’s how to quickly find out for sure if yours is supported by the latest Mac OS version. 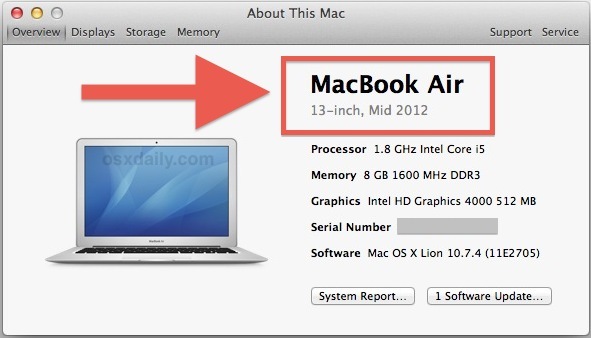 The above screenshot shows a brand new MacBook Air which is obviously supported, but the section highlighted in red is what you want to pay attention to. Take that information and compare it to the following list of Macs, which mirrors the preliminary system requirements for 10.8 almost identically. Supported Macs must be running Mac OS X 10.6.8 Snow Leopard or later, or Mac OS X 10.7.1 Lion or later, that requirement is due to Mountain Lion being available exclusively through the App Store as a download. If you skipped Lion, you can upgrade directly from Snow Leopard without incident. Much of this information has been independently confirmed with the GM builds, but the final compatibility list comes directly from Apple so there is no reason to wonder. OS X Mountain Lion is currently in GM but will be released to everyone this month for $19.99. I’m running the GM of Mountain Lion and it’s really good, much better than Lion and it fixes a lot of the issues with Lion. I would say it’s much better than Snow Leopard. Can I turn of file versioning, autosave, and other crapware features? I recently upgraded from lion to snow leopard. The speed improvement was the main reason, but also not having to deal with this new and moronic file versioning and autosave is nice too. Its clear that apple is no longer interested in providing a usable general purpose computer. However, they make nice cloud devices for the vulgar public. Upgrading from Lion to Snow Leopard? you meant to Montain Lion right? Nope I meant upgrading from Lion to Snow Leopard, i.e., moving from 10.7.x to 10.6.x is an improvement in just about every way possible. I was ready to just sell my laptop after dealing with Lion’s auto save, file versioning, auto closing and opening of apps, but it looks like I can probably get another year out of it with Snow Leopard. Anyone that thinks making a laptop more like an iPhone does not need a laptop. I need a laptop not an iPhone. Seems like a ridiculous reason to downgrade, you do know that you can turn all those features off right? You cannot turn off auto save and file versioning. I do not ever what two versions of any of my files (unless I have them under git), and I do not ever want any application to decide when to save a file. The link Paul gave shows how to disable file locking and restore save-as, not how to disable auto save and file versioning. Let me repeat I never want a program to decide when to save a file and I never want the file system to store multiple versions of a file. After using a computer for some 20 year I have never lost any work by forgetting to save a file. However in my first week of using Lion preview destroyed metadata in a PDF file by auto saving over the file. As a side note I have never got my computer infected with a virus either (even when using windows for years) so I don’t see any value in there new gatekeeper or whatever its called. Also where is the option to restore the speed of snow leopard? Like I said apple is making the right move in making OS X more like iOS, as for most people the concepts of files and needing to save them is confusing. For me however Snow Leopard will probably be the last usable version of OS X. OS X was awesome when it was a nice stable BSD based operating system, but those days are gone. Fortunately, there are Linux or FreeBSD are both options for my work flow. I feel bad for people who will have to switch to windows. Bob, that’s a downgrade, not an upgrade. Have fun living in the past. Lion was just fine. Mountain Lion is better. I agree with Bob, some of the simplification of OS X is not a good thing. Why can’t we at least turn that stuff off? Let those who want to use it, use it, and those who don’t, not. I feel like we are getting less choices and not more, that is not good. I also agree. I’ve made a point of not using any application that uses the Apple versioning filesystem. I find it ridiculous that the application decides when and where to save files. Anyone who is incapable of regularly saving a file should not be let loose on a computer. I want to control how the space on my hard drive is used, and not have the filesystem cluttered up with unnecessary versions of every file. My Mac Pro server is from 2006. Bummer. My iMac is from 2009, so that one should be fine. My PowerBook from 2005 is out of the question I guess. You know Emily, I agree. The price is nice, but the same price from SL or from Lion? I already paid that upgrade price once, seems like should have been bit cheaper for us Lion beta testers. Not going to moan and groan, still beats the Microsoft way of doing it without all the games they are trying in Windows 8. I actually think Apple is being really good about this. The fact that you can upgrade from Snow Leopard, without already being on Lion, is a very generous move. Let’s face it, the upgrade price is peanuts and Apple knows that lots of people will choose to upgrade. But no one is forcing you to upgrade now, if you feel you’ve not had enough return on your investment in Lion. Alex, Lion was $30. Mountain Lion is $20. That is a bit cheaper. You can always migrate over to Microsoft where the software costs hundreds of dollars. Are you suggesting Apple should spend all that time developing a new OS and just give it away? C’mon, get real. It’s an entire OS upgrade for only 40 dollars, an update that Apple would charge hundreds for. What games are they are trying? People like you are so arrogant and annoying. IF you are going to just bash Microsoft, at least have a legitimate reason rather than being a fanboyish prick. I prefer macs over PC’s, and I own a mac, but you are just an ignorant fanboy with no legitimate argument. Back in the old days the purchase price for a Mac OS Upgrade was $129.00 every time. I am more interested in if it can still run my printer (HP J4680 AIO). That’s up to HP. HP writes all the drivers for its hardware, even if it then provides them to Apple to be distributed with software update. All of the printers that work in Snow Leopard and Lion will work in Mountain lion. It’s stated in the 2012 WWDC Printing session. It’s nice that 10.7 shows the model date, like “Mid-2012,” but 10.6 does not do that. The System Profiler gives a precise “Model Identifier: MacBookPro4,1” but doesn’t idntify that by date. Fortunately, I found http://www.everymac.com/ultimate-mac-lookup which told me that my model ran from Feb. to Oct. of 2008, which squeaks by into the 10.8 crowd. Nice to see Apple supporting Macs from 5 years ago, rather than drop support. It looks like Mountain Lion has achieved some sort of equivalence with Windows 7 64 bit. Neither will run on many Macs with 64 bit C2D processors. Like mine. Please note that Macs as new as late 2008 DO NOT date the machine on the System Profiler. You will have to take your serial number and dig deep into the Apple website to find the date your machine was made. Will I loose photos or files when I upgrade to lion?